push a baby carriage 乳母車を押す. He pushed the button. 彼はボタンを押した 《ベルを鳴らす場合など》. Don't push me forward. 前に押さないでくれ. He pushed his chair away from the desk. 彼はいすを机から後ろへ押しやった. He pushed his bicycle up the hill. 彼は自転車を押して丘を登った. She pushed the thought out of her mind. 彼女はその考えを心から締め出した. She pushed the door open [shut]. 彼女はドアを押してあけた[閉めた]. push a task onto a person 人に仕事を押しつける. [push one's way で] (障害物を排して)押し進む. I pushed my way through the crowd. 人込みの中を押し分けて進んだ. [push oneself で] 押しのけて進む; (積極的に)人目につくようにふるまう. He pushed himself to the front of the crowd. 彼は人込みを押しのけて前へ出た. Don't push yourself forward too much. あんまりでしゃばるな. The slump pushed up unemployment to 23%. 不況で失業率が 23 パーセントに上がった. push one's own interests 自己の利益を押し進める. He pushed his exploration further. 彼はさらに探検を押し進めた. They pushed the bill through Congress. 彼らはその議案を議会に押し通した. push a new product 新製品を売り込む. He has no supporters to push him. 彼には後押ししてくれる後援者がない. push a car to over eighty miles an hour 車を時速 80 マイル以上にあげて走らせる. push the nation into war 国民を戦争に駆り立てる. I pushed him into writing to his parents. 彼にせっついて両親のところへ手紙を書かせた. They're pushing him to enter politics. 彼らは彼に政界入りを盛んに勧めている. 〔+目的語+to do〕[push oneself で] どうしても〈…する〉気になる. I had to push myself to accept the offer. 私はどうしてもその申し出を受けなければならなかった. push a witness for an answer 証人を強要して回答を迫る. He's pushing me for payment. 彼は私にしきりに支払いの催促をしている. push a person to the verge of tears 人を泣き出しそうになるまで追いつめる. [push oneself で] 〔…まで〕自分をせきたてる，がんばる 〔to〕. She pushed herself to the utmost to accomplish the task. 彼女はその仕事を成し遂げるために最大限がんばった. You always push yourself too hard. 君はいつも無理をしすぎる. She's pushing 70. 彼女は 70 歳に手が届く. I pushed (at the door) with all my might. (ドアを)力いっぱいに押した. I pushed through the crowd. 人込みの中を押し分けて進んだ. They're pushing for wage increases. 彼らは賃上げを要求している. at one push ひと押しに, 一気に. make a push 奮発する, がんばる. He's full of push. 彼は精力家だ. a big advertising push 一大広告キャンペーン. Push that button there in case of emergency. I can't push this thing uphill. The little boy pushed the dish off the table. The patient pushed himself on his elbow. I pushed the door open . She pushed her hair back. You can't push her into marriage. Mother's pushing the boy to go to bed. He will not work hard unless you push him. My boss is pushing matters. The saleslady tried to push a lot of cosmetics on her customer. The company is pushing trade with developing countries. They pushed their project to completion. The prosecutor pushed her for an answer. You're pushing me too hard. The ex‐idol of the teenagers is pushing sixty. The population of the city is pushing 300,000. They were pushing and shoving in line. The car pushed ahead through the heavy rain. The boy's curiosity was pushing out in all directions. The IT‐related company is pushing for international recognition. My boss pushes me around. I offered the boy some money, but he pushed it away. The union's pushing for a 5% raise. They pushed forward with preventive measures against the infectious disease in the region. He pushed his son forward to the world. She sure pushes in everywhere . It's time for me to push off now. Despite a lot of difficulties, they pushed on to their destination. The snail pushed its horns out. They pushed through the IT reform in the company. The movie star pushed through the waiting fans. Hurry up. We're really pushed for time. Don't push yourself forward in the social gathering. He pushed his way into the job. Can you help us give the car a push to get it started? The big push began in September. Don't push. There's enough room for everyone. Stop pushing against the wall. It'll give way. The car pushed ahead (on) through the heavy rain. The IT-related company is pushing for international recognition. The ex-idol of the teenagers is pushing sixty. The cat pushed the dish off the table. pushは押す動作に,pressは押された結果に焦点がある.そこで「押し花」はpressed flowersという.「ボタンを押す」はpush the button ともpress the buttonとも言うが,「ぎゅっと押す」場合はpressのほうが適切.pushの名詞形に「押し」「奮闘」「突撃」などの意があるのに対して,pressの場合は「結果」に焦点が置かれるため「出版物」「新聞界」「印刷機」などの意になる.また形容詞のpushingは「ぐいぐい押している状態」を表すことから「精力的な」,pressingは「ぎゅっと押された状態」を表すことから「切迫した,切なる」の意になる. Let's push the door open [shut]. You're alway pushing your girlfriend around. She sure pushes in everywhere[anytime, anywhere]. She had pushed the boat off the shore before her boyfriend could reach it. The missing politician might have been pushed off. She pushed him out of the room. The movie star pushed through the still gathering fans. He pushed his proposal through the executive committee. Don't get involved in the group. You may push up the daises. [SVO]〈人が〉〈物・人〉を押す, 突く(⇔ pull)；…を〔人・物に〕押しつける〔against, on, onto〕；[SVO(M)]〈物・人〉を押して動かす([類] push は意識的に動かす, thrust は無意識的に強く押す, shove は乱暴に押す). We pushed and pushed but the piano wouldn't move. 押すこと; [形容詞的に] プッシュ型の《利用者からのはたらきかけを要さない, 放送のような情報提供方式; cf. pull》. To deliver data to a client without a client request for the data. The process of sending data to a network server. From Middle English pushen, poshen, posson, borrowed from Middle French pousser (Modern French pousser) from Old French poulser, from Latin pulsare, frequentative of pellere (過去分詞 pulsus) "to beat, strike". Doublet of pulsate. 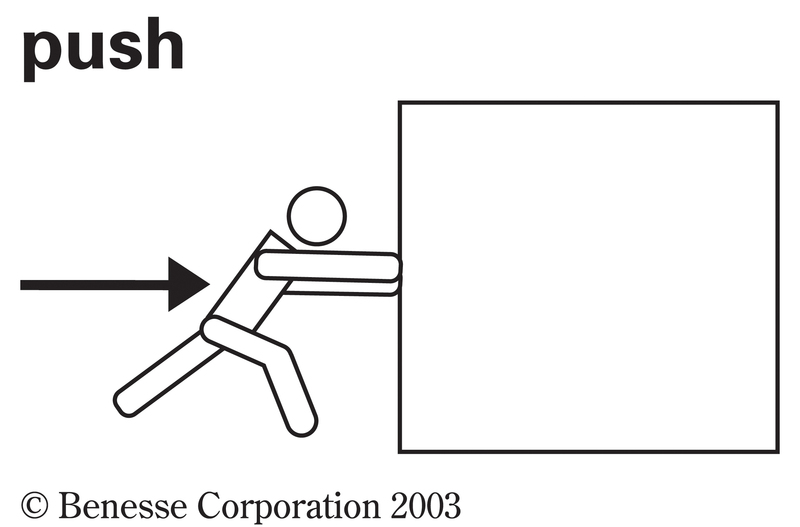 Displaced native Middle English thrucchen ("to push"; > Modern English thrutch) (from 古期英語 þryccan (“to push”)), Middle English scauten (“to push, thrust”) (from Old Norse skota), Middle English schoven (“to push, shove”) (from 古期英語 scofian), Middle English schuven (“to shove, push”) (from 古期英語 scūfan, scēofan (“to shove, push, thrust”)), Middle English thuden, thudden (“to push, press, thrust”) (from 古期英語 þȳdan, þyddan (“to thrust, press, push”)). (transitive, intransitive) To apply a force to (an object) such that it moves away from the person or thing applying the force. In his anger he pushed me against the wall and threatened me. You need to push quite hard to get this door open. (transitive) To continually attempt to persuade (a person) into a particular course of action. Ambition pushes the soul to such actions as are apt to procure honour to the actor. (transitive) To press or urge forward; to drive. (transitive) To continually promote (a point of view, a product for sale, etc.). Stop pushing the issue — I'm not interested. They're pushing that perfume again. There were two men hanging around the school gates today, pushing drugs. (informal, transitive) To approach; to come close to. My old car is pushing 250,000 miles. (intransitive) To tense the muscles in the abdomen in order to expel its contents. During childbirth, there are times when the obstetrician advises the woman not to push. (intransitive) To continue to attempt to persuade a person into a particular course of action. To make a higher bid at an auction. (poker) To make an all-in bet. (chess, transitive) To move (a pawn) directly forward. (computing) To add (a data item) to the top of a stack. (computing) To publish (an update, etc.) by transmitting it to other computers. Because this version of the Windows Installer is aware of the GAC, it has the capability to publish components into it. […] You can manually or programmatically push an assembly into the GAC by using the command-line tool Gacutil.exe. (obsolete) To thrust the points of the horns against; to gore. If the ox shall push a manservant or maidservant, […] the ox shall be stoned. To burst out of its pot, as a bud or shoot. A short, directed application of force; an act of pushing. Give the door a hard push if it sticks. An act of tensing the muscles of the abdomen in order to expel its contents. One more push and the baby will be out. A great effort (to do something). Some details got lost in the push to get the project done. Let's give one last push on our advertising campaign. An attempt to persuade someone into a particular course of action. (military) A marching or drill maneuver/manoeuvre performed by moving a formation (especially a company front) forward or toward the audience, usually to accompany a dramatic climax or crescendo in the music. (computing) The addition of a data item to the top of a stack. (Internet, uncountable) The situation where a server sends data to a client without waiting for a request, as in server push, push technology. Probably French poche. See pouch. (obsolete, Britain, dialectal) A pustule; a pimple. Push!! (プッシュ! !, Pusshu!!?) is a Japanese magazine published by Max that focuses on adult games. Each issue includes a DVD supplement. It was first published in 1993 under the name of Fantasienne (ファンタジェンヌ, Fantajennu?). Originally published by Shinyusha, the magazine transferred to the publisher Max.